Ten years ago, Barry Bateman, then a sprightly 52-year-old President of the UKheadquartered Fidelity International Ltd (FIL), made an interesting observation in leading US business magazine, BusinessWeek. There are just two global brand names in consumer finance: Citibank for banking and American Express for charge cards, offered Bateman. There was space for one more. “I would like the global mutual fund brand to be Fidelity,” declared Bateman. 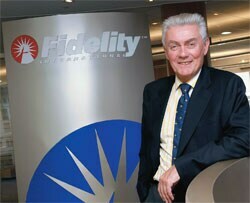 A decade down the line, Fidelity International hasn’t done too badly for itself, managing assets of $299.4 billion outside the America (FIL was spun off in 1969 from parent company Fidelity Investments; the Boston-headquartered Fidelity Management & Research LLC serves the North American market). More importantly, Fidelity has a sizeable presence in Asia-Pacific and, as Bateman explains, India and China will be Fidelity’s growth drivers over the next 15-20 years. As a mutual fund, Fidelity has completed three years in India, although it’s been investing in domestic equities as a foreign institutional investor for the past 15 years. Fidelity’s entry into the asset management space more or less coincided with the beginning of the India growth story. Was this sheer coincidence or should you be taking some credit for the timing of the entry? I’d like to say it was pure brilliance, but actually it was pure luck. The time was right for us. We had got our back office processing and systems development centre set up in Gurgaon (in 2001). It seemed to be working. And it seemed a natural progression to move into the asset management business. When we launched our first fund, we were a bit worried that the Indian market was hot—in hindsight that seems so ridiculous—but the point is that the timing wasn’t necessarily good. It was just an internal strategy perspective that suggested it was the right time to set up an asset management business in India. Also, being a private company allows us to take very long-term decisions. Our decision was: We wanted to build an asset management operation in India with a 10-year view, like most of our developments. India was beginning to get its act together, it was set for a long period of growth, and this growth would, like in any place in the world, be volatile. There would be dips, but we were pretty certain that India was one of those countries, which—if you looked at it with a long-term view—would grow substantially. Also, its substantial population with a rapidly developing middle class with areasonably high savings rate is a good setting for the mutual fund industry. The mutual fund industry is essentially a middle-class industry. It’s the middle class that is buying mutual funds. High net-worth individuals go to the investment banks and such firms. It was the right time to set up a mutual fund business. And it was a long-term view. Looking back, we’ve probably done better in a shorter period of time than we thought we would. We’ve obviously been helped by very buoyant stock markets over the past few years. We also have a good team under Ashu (Suyash, Head, Fidelity Fund Management India) that’s helped us. We do want to participate on both the equities and fixed income sides. You will see more resources going into fixed income in the next few years, and hopefully see some interesting products coming from the fixed income side as well. How would you rate Fidelity’s fund business in India over the past 3 years? We’re $2.5 billion (assets under management) now, and a million investors or accounts. I would have been happy if our assets would have been a billion dollars by this stage. But then we didn’t predict that the stock markets would be as buoyant as they were, and for as long as they were. As an equity manager we’re now at number seven. Our long-term ambition is to be in the top three (in India, in both equity and fixed income). I don’t have a date for that. It partly depends on markets, it partly depends on our investment performance. We have made a good start, and this is a market into which we can bring in some innovation in the next few years. "We prepare for the worst things we can think of"
"Our focus is the key to our success"